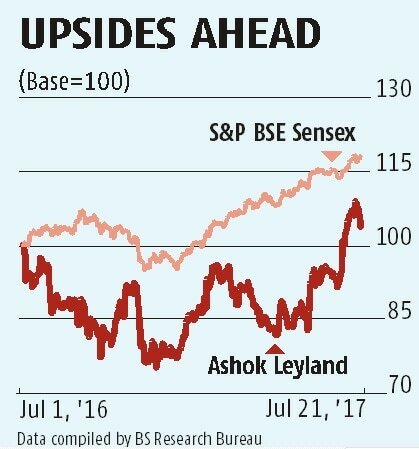 On a day when the broader markets were up, Ashok Leyland fell 2.5 per cent to Rs 103. The negative reaction was due to a muted performance in the June quarter (Q1), especially on the margin front. But, the bad news ends there, with analysts expecting the stock to deliver strong gains on the back of improving prospects for the company. Revenues were flat with an eight per cent drop in overall volumes set off by higher prices on account of BS-IV models. A weaker product mix coupled with higher employee costs led to margins falling over 3.6 percentage points, year on year, to 7.6 per cent. Medium and heavy commercial vehicle (MHCV) volumes, which fell 17 per cent, skewed the mix in favour of lower-margin light commercial vehicles (LCVs). Net profit came in below estimates. Despite the poor performance, most brokerages have a positive view on Ashok Leyland. Sneha Prashant and Abhishek Jain of HDFC Securities maintain their positive stance on the back of expanding distribution network, strong product portfolio, reduction in its debt and expectation of a recovery in economic activities. The positive stance stems from certain gains the company made over the last couple of years. Edelweiss Securities’ Chirag Shah and Karthik Subramaniam believe some structural trends will help Ashok Leyland. The first is the shift in demand to higher tonnage segments, which given Ashok Leyland’s strong positioning, should help the company consolidate its market share. The shift to this segment is due to improving road conditions, shortage of drivers and ban on overloading. 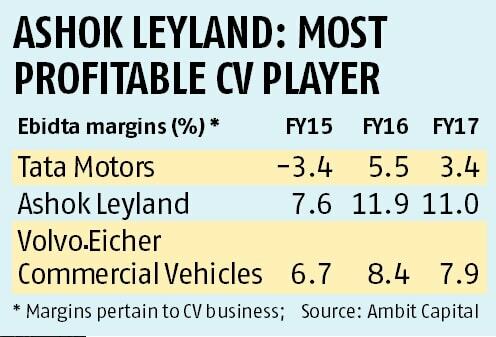 Ashok Leyland is the market leader in the 26-35 tonne tractor-trailer segment with a share of 42.5 per cent, and it is a close number two in the above 35 tonne market as well. Distribution and after sales have also played an important role in Ashok Leyland’s performance. After filling gaps in its portfolio of small, intermediate and heavy commercial vehicles, the company expanded its network by 28 per cent over 2015-17. This helped its volumes grow 24 per cent over the period. 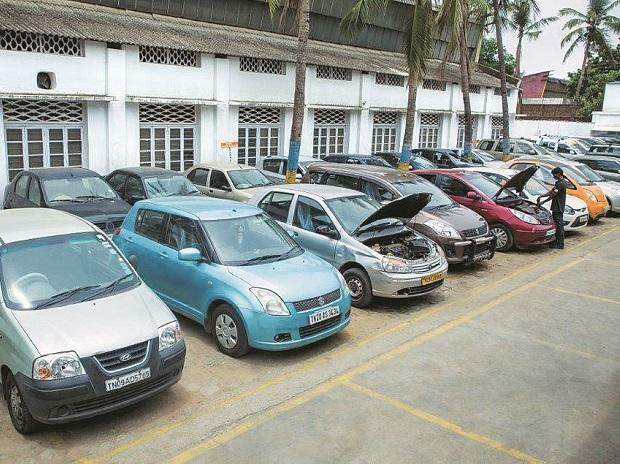 The company’s market share in commercial vehicles stands at 34.7 per cent, gaining 8 percentage points over the last four years. It has gained market share in 12 of the last 13 quarters, led by the success of its intelligent exhaust gas recirculation (iEGR) technology. This, the company says, is superior (lower maintenance costs, better engine life) to technology used by rivals based on selective catalytic reduction or conventional EGR systems. In addition to MHCVs, the company is undertaking initiatives in exports, defence and LCVs. 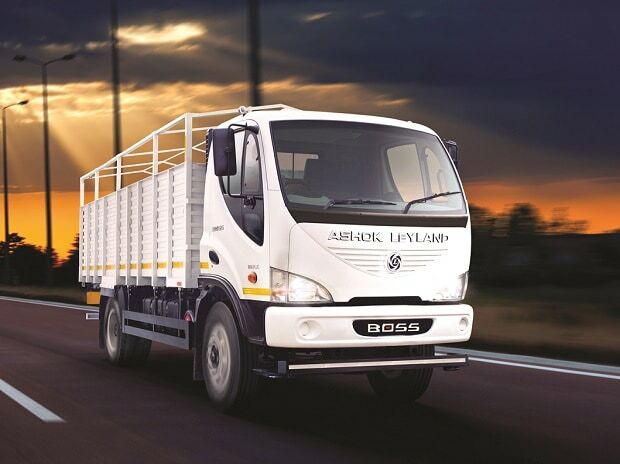 After taking over complete control of the LCV business (earlier in a joint venture with Renault), which contributes about 32 per cent to overall volumes, Ashok Leyland is increasing its focus on product development to improve its offerings to cater to each of the multiple sub-segments. In fact, it is the LCV business that has been shoring up volumes in recent months, while the truck segment has been a laggard, reporting either a fall in volumes or single-digit growth. While the company is looking at new bus plants in Africa and an enhanced sales force to drive international operations, it is eyeing the defence space both in India and abroad with solutions based on current platforms. Plans to increase its share of exports, defence and spares, given the higher margins that they fetch, should help boost margins from the 11 per cent Ashok Leyland achieved in 2016-17. Despite the strong sales performance and expansion, the company has been able to keep costs under control with a lower working capital cycle, which coupled with healthy cash flow from operations has translated into almost negligible debt levels at the standalone level. Net debt to equity currently is at 0.3 times. The stock, which has gained 24 per cent since May, could see more gains as the company’s initiatives take shape. It is currently trading at 15 times its 2018-19 estimates and could return another 25-30 per cent, considering its target price of Rs 130-135.